Why play a play money tournament online? For new players especially, there are lots of reasons. Play money games online actually have many uses, particularly for those who are learning the game. Earlier this week while watching Monday Night Football I very randomly chose to join a play money tournament on PokerStars, something I haven't done in quite a long while. The fact that the Buffalo Bills were clearly not going to be competitive against the New England Patriots is probably what prompted me. There would be 630 players altogether, and after running decently by avoiding losing all-ins in which I had the edge, I managed to survive down to the last few tables with an above average stack. Soon enough — and just as the football game was ending — we'd reached the final table where I was seventh in chips. Remaining patient, I continued to run well and survived to three-handed at which point I'd taken the chip lead. I suffered one setback, making top pair with ace-king but losing an all-in to an opponent who turned two pair, but got lucky again to knock out that player and then the other. After just a couple of hours I had won, my "prize" totaling just under 1 million play chips. When it was over, I was asking myself a question I'm pretty sure would not have occurred to me had I busted out within the first five minutes. Why did I bother? Thinking further on this question for the last couple of days, I realized that besides the entertainment value, there are some genuine benefits to be had from playing the play money poker games online — real, tangible benefits much more meaningful than a big pile play chips. There's a brief scene in The Cincinnati Kid that comes up right before the "Kid" (Steve McQueen) finally plays the "Man" in the climactic five-card stud game that concludes the film. The Kid gets out what looks like a notepad and flips it open, and we see it is actually a workbook of math exercises. He doesn't use a pencil. Rather he goes through the questions one at a time, mentally completing equations that test knowledge of percentages (e.g., "12½ of 224 = "). It might seem to some viewers like an odd thing for him to do, but for poker players the purpose for doing the exercises is obvious. They are a way for him to keep his mind sharp, ensuring he'll be ready to work out odds and probabilities at the table in a few hours. Playing a play money tournament certainly gives players a chance to practice their "poker math." Occasionally when three-betting preflop I would do a similar kind of mental work to help decide upon bet sizes. Similarly when playing postflop, I was looking at the size of the pot and of my opponents' stacks in order to determine how much to bet or raise. I also, of course, was mindful of outs and probabilities when playing drawing hands, although to be honest I wasn't as "active" in my thinking along those lines either, given that I'd memorized most of that math long ago. Still, for a newer player, playing such hands can function as quizzes to help learn those percentages. Sure, many of those sitting around the play money tables aren't playing "correct" strategy, but such math problems are the same whether you're playing for play chips or hard cash. Play money games and tournaments also provide players opportunities to improve their ability to identify patterns in opponents' playing styles. The fact that some players play erratically in play money games doesn't actually disturb this fact very much. Even those who are betting too much or playing too many hands are still demonstrating certain patterns an attentive player can perceive and then figure out how best to try to exploit. Again, to be honest, I wasn't bothering too much with such rudimentary "profiling" during the early going. But once the tournament neared its conclusion, and especially at the final table, players revealed themselves to be aggressive, passive, loose, and tight in much the same way players do when playing for real money. For newer players especially, playing play money tournaments is a great way to get familiar with tournament structures and the changing dynamics created when fields get smaller and stacks shallower. Many online poker sites have play money tournaments that are structured in ways that exactly mirror real money tournaments, with the same duration of levels and scheduled increases of blinds and antes. Practicing with such tournaments can help players get acquainted with the different strategies required during the early, middle, and late stages of tournaments. Thinking again of new players just getting started with poker, there's a great variety of play money tournament formats available, with fast and slow structures, and shallow and deep stacks. Of course, there are also sit-n-gos, heads-up matches, and other quicker tournaments available for those not wanting to play longer multi-table tournaments. 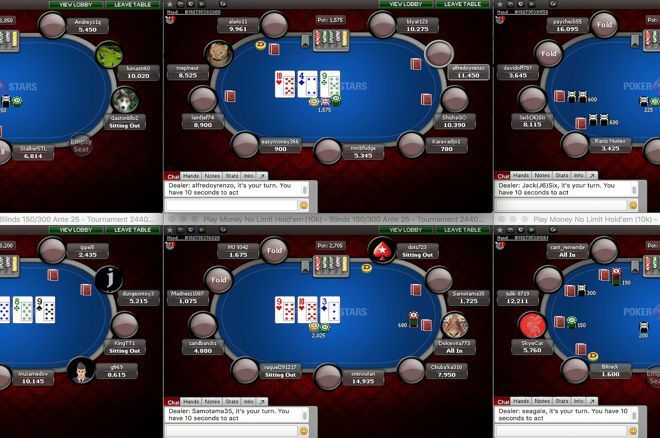 Looking beyond no-limit hold'em tournaments, most sites also offer both play money "cash" games and tournaments in a wide variety of poker variants, meaning if you want to learn how to play pot-limit Omaha, seven-card stud, deuce-to-seven triple draw, Badugi, or other games, you can do so without risking a dime. I remember when I first started playing online poker way, way back in the early 2000s. Whenever trying out a new site, play money games were always where I started simply to help myself learn how to join games and where all the buttons were located. I'd recommend to anyone trying out a site for the first time to join a play money game first, if only to avoid making real money, bankroll-depleting mistakes when learning how to use the client. While I faced some decent opponents, I'm not going to pretend the tournament I played Monday night provided the same sort of competition you face even at the micro stakes online tables. Still, the tournament was more competitive than the Bills were against the Patriots. And just as New England probably learned something useful while cruising past Buffalo on Monday, play money tournaments can have uses for poker players, too, especially those who are new to the game. Is it Ever Correct to Fold a Set in a Low Stakes Poker Game?